When Ghost in the Shell was released in 1995, the future technology of choice seemed to be virtual reality. The Star Trek universe had established the holodeck as a go-to future tech and Nintendo had launched the Virtual Boy to terrorize necks everywhere. However, the Ghost in the Shell world went in a different direction. Instead of replacing reality with virtual escapes, Ghost in the Shell tackled cybernetic enhancements, interconnected technology, and augmentation of reality in the faraway time of 2029. In 2016, while virtual reality definitely exists, the setting of Ghost in the Shell is much more familiar. Cybernetic enhancements aren’t exactly common, but smartphones and apps may be the next best thing. The app of the moment, Pokemon Go, is a great example of the mainstream application of augmented reality. The quest to capture dozens upon dozens of virtual Pikachus seems frivolous, but it’s a meeting point of reality and millions upon millions of data interconnections. These connections may not be taking place inside our brains, but smartphones and wearables have essentially become extensions of our bodies. Smartphones in particular have become so imperative to our daily life that separation from our devices has its own term, nomophobia, where an individual experiences overwhelming anxiety when away from their phone. We are now so used to having instant connections to information and communication that a dead battery feels like part of ourselves has been severed. Augmented reality is being integrated into our lives through other devices as well. Google Glass may not have taken off, but the technology is still being implemented in other devices. Contact lenses, snowboard goggles, and heads up displays in cars are integrating augmented reality to improve user experiences. The technology is also being used as a teaching and care tool in medicine to enhance medical outcomes for patients. This enhanced reality enables us to access limitless information from the all over the world in any language. We can use it to identify the plants in front of us, the stars and constellations in the sky, or translate signs in foreign languages. Thus, while catching virtual Pokemon may seem pretty far from a world of future-tech law enforcement, the technology behind is pushing us closer to that reality. Augmented reality isn’t the only Ghost in the Shell-type technology present in our world. The central plot point of a hacker stealing people’s lives and memories in Ghost in the Shell reflects our reality of identity and other mass data theft. 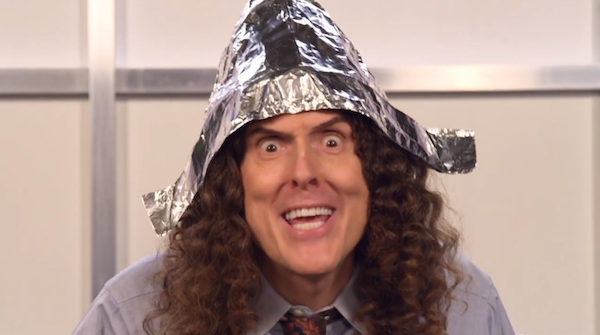 Of course in 2016, no one is hacking directly into your brain or taking over your actions [especially with your stylish tinfoil hat]. However, with the advent of social media we’ve started to store our pictures, videos, thoughts, and terrible terrible political opinions on-line. This explosion of social media has also lead to countless hacking [also “hacking”] incidents. These incidents can cause quite the uproar if targeted at the right person. As more official information is shared through these accounts, including from the President, the danger of unauthorized access to these networks grows. Much like the world of Ghost in the Shell, the security of these networks is becoming more vital to national and personal security. The internet of things also presents an interesting risk. Network capability is being added to standard objects in our life. The most popular application, thermostats, used this technology to improve energy efficiency and give users more information about their power consumption. These thermostats have become so popular that many power companies will offer rebates to customers who install them in their homes or offices. The popularity of devices like this led to an explosion of web connected devices. Today, you can purchase a garage door opener that alerts you when it’s left open, washers/dryers that alert you when loads are unbalanced, and doorbells that stream live video to your phone. The usefulness of this technology is debatable, but it’s a fascinating world where someone can take over appliances in your home. Someone causing your washer to repeat the spin cycle may not seem too terrifying, but the ability for someone to shut down the smoke detectors and security cameras in your home from anywhere in the world is a real concern that doesn’t have a foolproof solution. The world of 2016 isn’t quite the striking technological marvel of Ghost in the Shell, but we’re closing in on that vision rapidly. The fast pace of technological development will also lead to many of the same ethical and security concerns presented in Ghost in the Shell. Hopefully, our world comes up with slightly more diplomatic solutions than those undertaken by Section 9.